Someone once asked us to detail the difference between a Porsche GT3 and a GT3 RS? Our answer, "The Porsche GT3 is designed for occasional use on the race track while the Porsche GT3 RS is designed for occasional use on the road." Porsche intends to prove this during the historic Nürburgring 24 hour race this coming May. In addition to Porsche running their standard contingent of 911 GT3 RSRs - that have dominated their class for the last four years running - Porsche legendary test driver Walter Röhrl will compete in a standard Porsche 911 GT3 RS that any of us can purchase (if you have the money and the skills to handle it) from a local dealer. “Right from the word go, the new 911 GT3 RS reminded me of race vehicle,” says Röhrl. “No other road-going 911 has ever been as close to a race car as this current GT3 RS. That’s why I’m thrilled to be able to prove that this sports car is up to the challenge of the 24 hour race.” It's safe to assume the car will be well supported by the factory so if Röhrl runs the course well, and there's no reason to believe he won't, this could be a huge marketing coupe for Porsche. On the other hand, if the car has mechanical problems (a lot can go wrong in a 24 hour race) or if for some reason Röhrl isn't up to the task... Full details below after the jump. Video of the 2010 Porsche 911 GT3 RS. Turn up the Volume! 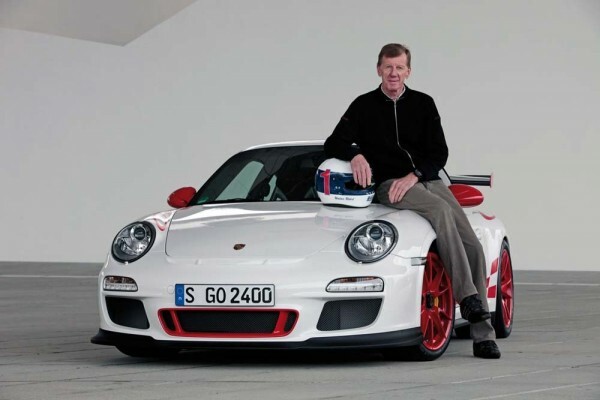 Porsche ambassador and test driver Walter Röhrl (62) will contest the Nürburgring 24 hour race in May 2010. The double world rally champion pilots a standard Porsche 911 GT3 RS. This marks the first time since 1993 that Röhrl competes in Germany’s largest automobile race. The new Porsche 911 GT3 RS is powered by a 450 hp, 3.8-litre, six-cylinder boxer engine. The high-revving unit reaches a specific output of over 118 hp per liter. Developed in the motorsport department at Weissach, the 911 GT3 RS is fitted with a particularly short transmission ratio for racing purposes as a standard feature. The dynamic engine mounts featured as standard contribute to improved driving dynamics. Depending on the driving situation, the mounts change in their stiffness and damping effect, improving the connection between the engine and body when driving under racing conditions. The aerodynamics is consequently designed for downforce - another forte for track racing. The 38th running of the Nürburgring 24 hour race takes place from 15 to 16 May 2010. Every year, this event attracts far more than 200,000 spectators to the Nordschleife. What Happens When The Price Isn’t Right? it will be great to cheer Walter on! Let us know when you’re getting close to going and maybe we’ll tag along.